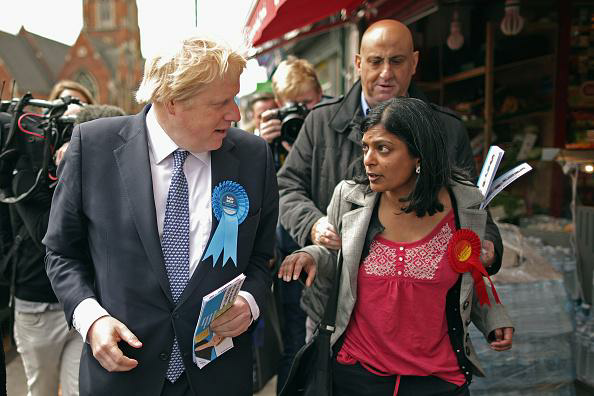 A Tory henchman intimidated and manhandled a female Labour candidate who was attempting to debate with Boris Johnson. The man apparently works for local Tory candidate Angie Bray – who later tweeted an apology and said she had now told the man to ‘step down’ in light of the incident. My question is – why was Boris so reluctant to engage in debate and why did he do absolutely nothing to prevent the intimidation at the time? She may have the tongue of a viper, I don’t know, but I do know that Boris is actually looking at her in that photograph and unless he’s blinded by her beauty he could see that the bodyguard had a hold of her. A gentleman would have asked the bodyguard to unhand her, a gentleman would. We can expect nothing less from the shower of Tories in government at this time. They are ALL Parasites & they have the Cheek to Class Unemployed & Disabled people as a waste of space to the Tax Payers of this country. ( There but for the Grace of God go I ) was the old saying. But with the Tories, there is NO SHAME!!. And most definitely NO GRACE. This idiot should be done for assault – you’ve only got to look at the picture to see that she is being pulled about. As for the twit called Boris, sorry but he’s no man as a real man would have stood up to the bully – there again, the bully is no man either as true men don’t manhandle a woman in such a way. David Cameron has repeatedly shown himself to be a coward, who runs from honest debate. Witness the way he tried to alter the conditions of the leader debates, so he wouldn’t have to go one on one Ed Miliband, or indeed, any of them. It seems that Boris has the same instincts. It also points to the fundamental intolerance right at the core of these men’s psyches. Cameron is infuriated if the lower orders dare to talk back to him. So apparently is Boris de Feffel Johnson. They’re aristos, who believe they have an unquestioned right to automatic obedience by the proles, and become angry when this deference is not granted. One of the commenters, Nick, says that Mrs Huq is the mother of a Konnie. I wonder if this young lady is the former Blue Peter presenter and the wife of Charlie Brooker, the presenter of Screenwipe, Newswipe and the forthcoming Electionwipe. And if she is, I wonder if this is the real reason he has now offered an apology. This happens with politicians of all parties, it’s not news. All politicians avoid difficult questions etc. is this not an assault? Typical tory, terrefied of questions in case they are caught lying again as they always do. This lady should report this to police and refuse to be bullied by these vile ilagitimates. New claimant pensioners from 2016, with the state pension payable if can remain in work or lose job under the massive austerity job cuts even worse to come, will get not even £38 per week or even NIL for life, even after a lifetime in work. HOW MINISTERS COULD CHANGE THINGS WITHIN 5 WEEKS OF COMING TO POWER IN MAY? From another blog I learn that Labour does not need to enact legislation revoke the Coaliton’s Pension Bills 2010-2014 (flat rate state pensions) abolition of the state pension for so many on and from 6 April 2016. There is a means called an SI to just give 28 days notice and within 5 weeks a workaround could be found. …Statutory instruments are made in a variety of forms, most commonly Orders in Council, regulations, rules and orders. The form to be adopted is usually set out in the enabling Act. Statutory Instruments, also known as SIs, are a form of legislation which allow the provisions of an Act of Parliament to be subsequently brought into force or altered without Parliament having to pass a new Act. They are also referred to as secondary, delegated or subordinate legislation. Acts of Parliament confer powers on Ministers to make more detailed orders, rules or regulations by means of statutory instruments. An Act will often contain a broad framework and statutory instruments are used to provide the necessary detail that would be too complex to include in the Act itself. The Pension Bill 2014 brought in the flat rate state pension law 2016, because it takes 2 full years for legislation to become law. Locking the Tories is vital, in this Vote or Starve election. But Labour is on course to lose all 40 Scottish Labour. However SNP have said that they would vote against a TORY QUEEN’S SPEECH, so stopping them from ruling in a caretaker government in the coming predicted minority / severe hung parliament, when neither Labour nor Tory gain sufficient MPs for the minimum threshold to rule on their own as a majority. The Tories can just sit in power in a caretaker government, even with less MPs than Labour, if neither Tories nor Labour get that minimum threshold of number of MPs. So the grey vote could save all ages, if but Labour would grant a decent state pension and reverse the rise in retirement age and abolition of state pension to so many men and women by the flat rate state pension. so why are tories campaigning for labour in scotland…? Boris Johnson is one of the more loathsome characters in the Nasty Party, but he hides behind a wafer thin veneer of totally false buffoonery. He is incapable of taking part in a serious political debate with any of his opponents.